Tired of your casual curly hairstyle? I offer you totally new ideas of curly short hairstyles that will transform your image and make you love your curls even more. The combination of two best styles will surely do a good thing to your image especially if you are not afraid of dramatic changes so let’s get started our trip to new hairstyles trends 2014. Those details have just one disadvatage; sometimes such combination is not suitable for face shapes like round or square so before chopping off hair you can learn more about curly short hairtsyles and examples that will be more suitable for different face shapes. The owners of oval shape can experiment with even the boldest short haircut like pixie. For curly hair you can choose short pixie with longer bang that will give you more styling options. Short layered bob is also amazing option for oval face shape. Short curls will look so cute and feminine. 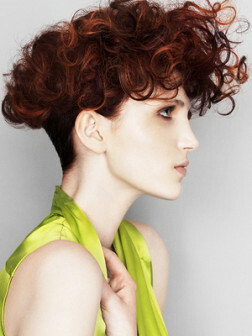 Women often think that short hairstyle is not suitable for round face shape especially if it is styled in fluffy curls. Those pictures of short curly hairstyle will totally deny this rule. The best option for round face shape and natural curls stylists offer longer asymmetric bob that are chin length or below chin. Soft massive waves will look simply stunning. Heart shaped face will look even more feminine and soft with short bouncy bob. Choppy layered bob will be perfectly suitable for thin hair. In order to make your hairstyle even more voluminous you can wash hair with volumizing shampoo. The main problem when it comes to square face shape is to add volume to the crown area. It can be short undercut hairstyle with longer layers on the top that can be styled both curly and sleek.